I made these chocolate crosses for my nephew's 1st Holy Communion. They were made using colored candy melts, and they are not very difficult to make. I melted the candy melts over double boiler, poured the melted chocolate into the lollipop cross molds and added the sticks. 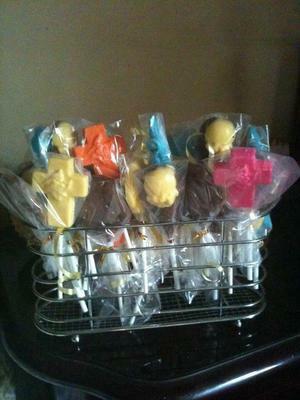 I then refrigerated the molds until the candy was firmly set. Finally, after removing the cross lollipops from their molds, I wrapped each one in a cellophane bag and tied a ribbon for decoration and to hold the bag securely. That's it! I hope you like them. Cross chocolate molds are a great idea for a party favor for first communions, baptisms, confirmations, bar mitzvahs, or any special religious occasion. Your cross shaped lollipops turned out beautifully! I like the array of colors you used. Of course, if someone wanted to stick with plain white, milk, or dark chocolate, they could do that too. In fact, for those of you who love the idea of Connie's religious chocolate molds as much as I do, here's where you will find all the supplies you need to create your own gorgeous religious or Christian party favors. Let me warn you that you'll probably find yourself browsing all over Candlyland Crafts and coming up with even more fun candy making ideas as you see all the great things they have to offer. I can get lost there for ages! Thanks again, Connie, for sharing another of your cute creations with us. You're inspirational! I hope everyone else will follow your example and share their recipes, party favors, and homemade candy creations with us, too. Join in and write your own page! It's easy to do. How? Simply click here to return to Custom Chocolate Candy.